Two tracks, one island platform. The tracks end in bumper blocks at the north end of the station. This station has recently been renovated. In keeping with the IND tile color family pattern, the tile band is claret red in the center, but has a 15% light grey border. (No original mosaics were installed. Current mosaic tile installed in 1999 renovation. Before renovation, the old tile had no color band, just "207" captions every few feet.) This new tile is made up of pre-fabricated panels hung on aluminum laths. White grout was used, giving it a seamless appearance. There are no mosaic name tablets. The I-beams are painted cherry red. The station has a full mezzanine and vent chambers in the north section. The mezzanine wall tile now features square accents that match the new tile band below. An A.D.A.-compliant elevator is under construction at the south (207th Street) entrance. Four tracks, two side platforms. The center tracks are yard leads for the IND's 207th Street Yard and shops. The tile band is maroon with black border. There is a crossunder near the center of the wall platforms with the booth located on the southbound platform. Fare control is at platform level. Two tracks, two side platforms. This is one of the deepest stations in the system, approximately 140 feet down, well under Fort Tryon Park. The line at this point was built as a deep-bore tunnel and the walls have the curved tunnel bore look, as opposed to the typical IND cut-and-cover look. The tile colors are like those at Dyckman St. On the northbound side there is a big name tablet reading "190-Overlook Ter. ", but the matching one on the southbound side has been painted over. There is a small mezzanine with the fare control gates above the center of the platform. There are "Uptown" and "Downtown" directional mosaics in the mezzanine, and the south end affords a view of the tracks. There are two exits from the 190th Street/Overlook Terrace station, neither of which leads to 190th Street or Overlook Terrace. One exit is via elevators to Fort Washington Avenue at Cabrini Boulevard and the Margaret Corbin Circle entrance to Fort Tryon Park. The elevators are still manually operated by an attendant. The other exit is a long downward-sloping corridor out to Bennett Avenue between 192nd Street and Broadway. Two tracks, two side platforms. Another deep station, similar to 190th Street. The platforms have wall tile like Dyckman St. and a name tablet at the extreme north end. The tile wall features concrete arches highlighted by tile and a large "181" numeral. An old sign for Yeshiva University was found. The station has a full mezzanine over the tracks. 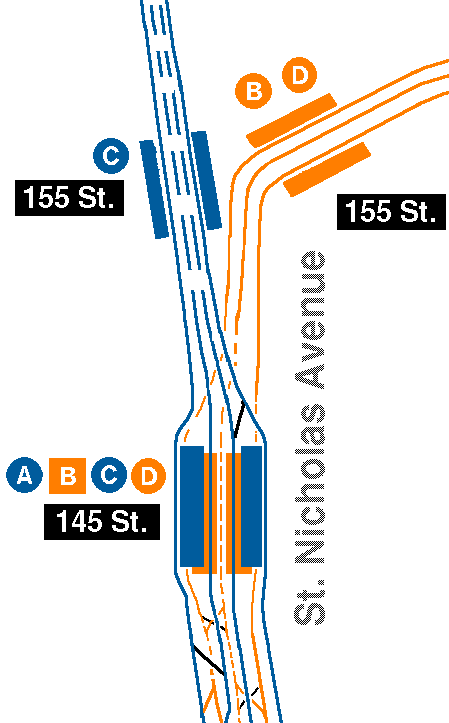 The north fare control is at 184th St. and the south fare control is at 181st St. The south exit is reached by new long escalators. A crossover between directions is afforded via the mezzanine. Two tracks, one island platform. This station has no color tile and no mosaic tile name tablet like other IND stations, but, it is one of the few fully A.D.A. accessible stations with an elevator between the platform and the full mezzanine. At the 177th St. end of the mezzanine, there is another elevator to sidewalk of 175th Street and Fort Washington Avenue. Four tracks and two island platforms, approximately 80 feet below the surface of the street. The local trains berth in the center tracks as their terminal. The expresses run thru the station on the outer tracks. The center tracks continue in Broadway, along with the outer tracks, to a small layup yard. A connection to New Jersey via the lower level of the George Washington Bridge had been proposed when the subway, and bridge, were under construction, but nothing ever came of the idea. The platform-level tile band is a reddish purple with black border, and there are no name tablets. There is a full mezzanine with the fare control in the center nearer to 167th Street. There is also a passageway leading to a set of elevators down to the Broadway line. Two tracks and two wall platforms. The tile band is gold with a black border and a name tablet in reversed colors is present. Vent chambers are present near the north and south ends. The station has two closed north exits (to 163rd St.) and one closed center exit (to 162nd St.) The station had a full mezzanine and has uptown and downtown directional mosaics. The fare control is in the center and an exit to 162nd St. is outside the fare control. Two tracks and two wall platforms. There is an emergency exit from the lower level onto the platforms. The name tablet is gold with a black border, but there is no color tile band. The I-beams are painted gold to match the tablet tile. The north end of the platform has vent chambers and a high ceiling. The fare control is in the center of the mezzanine. The south end of the mezzanine slopes down outside the fare control and is very dim. Seven tracks on two levels. The upper level is used by the IND Eighth Avenue trains and has four tracks and two island platforms. Tile band is gold with black border. The station had a full mezzanine but the central portion is now used as a police precinct. The lower level has two island platforms and three tracks. The tile border here is gold with black and the name tablets are black with gold border. The northbound platform is extra wide, such that the three trackways line up directly underneath ones above. Escalators lead up from the lower level to the mezzanine, bypassing the upper level platforms. This station is useful for reaching the northern parts of the City College campus. The station and the streets leading to the College are well policed. Area Track Map - North of 145th St.
Area Track Map - South of 145th St.
South of 145th Street to just north of 125th St. the line has six tracks, with the express using the innermost pair of tracks and the locals the outermost pair. This section of track is nicknamed Homeball Alley due to the large amount of switches and signals. 135th Street station has two side platforms alongside six tracks. This is only station in New York City that has six tracks passing through but is only a local station. There is a dark green tile name tablet with a black border on the side walls, but no color tile band. There is a closed old wooden token booth at the 137th St. exit. The 135th St. fare control is at platform level with no crossover. An express station with two island platforms and four tracks. Tile band is marine green with a black border, but there is no name tablet. The I-beams are painted a slightly different green. The floor tile is an unglazed reddish-brown brick. The original white wall tile has been replaced by buff vertical brick, which can also be seen at the ends of the platforms. The station has a full mezzanine with crossover and features photos of the old El at 125th St. as well as other pictures of the area. There are closed center stairs to the street. The south half of the mezzanine can be closed off and is dimmer than the north half. The north half of the mezzanine has two sets of closed stairs to each platform. Evidence of at least two removed sets of stairways can be seen at the south end of the platforms. Four tracks with two side platforms. There is no color tile band. The 117th St. exit is closed and the 116th St. fare control is at platform level. No crossover or crossunder was found. Four tracks with two side platforms. Tile patterns are like 116th Street. There are new tile name tablets. The "110" captions have been replaced by white tile, but a few remain beneath the tablets, remnants of old directional signs. At the south end of the station the express tracks are lower than the local track and rising. The mezzanine at 109th Street has a crossover plus new "uptown" and "downtown" mosaics. The 110th St. fare control is at platform level, on the southbound side only. There is no northbound 110th Street exit any longer; what is left of it is visible via an opening in the new tile. The next stations through and including 72nd St. are on two levels, with the uptown-bound trains on the upper level, and the downtown trains on the lower level. There is one side platform for local service on the west side of the station on each level. The express track is to the east of the local track along the tunnel wall. Tile color is blue with a black border with blue I-beams. At 103rd Street, the fare control is at platform level. At the north end of this station the uptown express tracks descend in preparation for the four track alignment at 116th St. The exit to 102nd St. has been tiled off. Fare control is in the center a few steps down from the platform. The stairs to the lower level are inside at the fare control. The station has a closed 95th St. exit as evident by old tile and is behind plywood. A look through the peephole revealed only darkness. Fare control at platform level; stairs from the lower level at 86th St., 87th St., and 88th St. This station has recently undergone renovation, and, as a result, is the only 8th Avenue local station so far to have tile bands. These are midnight blue with a black border, which matches the original tablets (these have been retained and restored, along with the black "81"s) - the upper level's tile band is wider and lower than the lower level's. New lighting has also been installed. Fare control is at either end of the station, and the south exit has direct access to the Museum. At the south end there is direct access into the museum. The exit to the street here is consistently called '77th Street' on direction signs, but it's actually at 79th Street. It sits directly under the statue of Teddy Roosevelt on the monumental entry of the Museum. The long ramp to the street merely gets the rider out from under the horse, the broad stairs, and carriage road of this entry. When you get to the street you are about at 78th Street, not 77th Street. Platform level fare control. There is a closed 71st St. exit. There is also a closed exit in the middle which is now an emergency exit. A blue name tablet with black border is present as is uptown and downtown directional mosaics. Four tracks and three island platforms, the center platform is disused for train boarding. The station has exits at 59th, 60th, and 61st Sts. At this station the IRT and IND cross with the IND being below the IRT. The station has a mezzanine at 61st St. which connects to the IRT #1 uptown, one at 60th St. which connects to the downtown #1, and one at 59th St. which features escalators to the street from the fare control. The north fare control is up a few stairs from the mezzanine. The exit at 60th Street emerges in a small "well" next to the 'World of Trump' globe on the north end of Columbus Circle. This was built by the former Gulf+Western tower and renovated by Trunp for his hotel-condo remake of that tower. The center island was originally used for unloading of passengers and is no longer used due to difficulty in opening doors on both sides of the train, and to eliminate the resulting confusion of which platform is for what service. It is occasionally used for fan trips, for instance the Summer 2000 Nostalgia Train trips. There is a complex route selector panel on the south end of both southbound tracks for: A,B,C/K,D,Other, plus two future use choices and cancel. Two levels, with two side platforms on each level. The trains to/from the Central Park West stop on the upper level, Queens Boulevard/53rd Street trains on the lower level. The two levels seem like typical IND overbuilding. The Queens trains could have easily run through the station without stopping to speed up the journey from Queens. But the station was built when Madison Square Garden stood upstairs, where Worldwide Plaza is now. It is plausible that the extra platforms were needed for the Garden crowds. The two platforms on each side are out of phase: the upper level runs from 50th to 52nd, the lower from 49th to 51st. On the southbound side, the fare control is at the upper platform level, and there is elevator access to both platforms and street level. The northbound side has fare control three steps up from the upper platform. There is a closed exit at 52nd Street; closed stairways connecting the uptown platforms at 51st Street; an exit at 51st Street from the uptown platform but not from the downtown platform; a former entrance to the lower level platforms at 49th Street, which has been completely removed on the uptown side, with access from the street to the mezzanine on the soutbound side (the stairs to the platform have been closed, apparently as a crime prevention measure); no crossovers between direction provided at any entrance. During the construction of the Worldwide Plaza complex in the 1980s, a closed fare control area was opened up and an original wooden token booth found inside. This was fixed up and is now in service on the downtown lower level platform. There might have also been a passageway, just north of the uptown token booth, that linked this station to the 50th Street/Broadway station. No free transfer was ever provided. The name tablet is dark purple with black border and there is no color tile band. Express station with four tracks and two island platforms in use; abandoned lower level with one track and one side platform on the downtown side. The Times Square/42nd Street complex is the busiest in the system and consequently the platforms here are extra wide to accommodate passenger volume. In order to fit the wider platforms, they are offset from north to south; the southbound platform extends between 40th and 42nd Sts. and the northbound between 42nd and 44th Sts., approximately. The mezzanine of this station extends from 40th to 44th Street. Ramps are in place for access to the mezzanine, which is somewhat unique in that there are retail stores within the fare control (including a record store), as well as various NYCT offices. The tile color is dark purple with black border and there is no IND-style tile name tablet. In addition to the platforms described above, there is an abandoned lower platform on the southbound side (one track, underneath the downtown local track on the upper level, and one side platform underneath the island platform above). The lower level platform was built along with the rest of the station in 1932, but it was only used from 1959 to 1981 for odd services like the Aqueduct Racetrack special fare trains, and for rush hour E trains for a period during the 1970s. For many years, a crossunder was open between the upper level platforms using a passageway at the northern end of the lower level. Rearrangement of the mezzanine a few years ago allowed passengers to crossover using the mezzanine within the fare control. It isn't really clear why this lower level was even built. It can only be used by trains running from Queens via 53rd Street (today's E service). Heading downtown on the track from the lower level of 50th Street, switches allow access to the downtown local, downtown express, or lower level of 42nd St. Departing 42nd Street on the lower level, trains can become local or express prior to entering 34th Street; however, trains departing 42nd Street on the upper level cannot cross over until reaching Canal Street. It is likely, therefore, that the extra platform was built to allow some operational flexibility, by permitting trains from 53rd Street to have access to both downtown local and express. Perhaps there was no other suitable location for a crossover switch, or it was thought an extra platform face could allow increased dwell time or time for switches to line up. An oft-repeated story offers this as a reason the lower level was built: The Independent subway was being built by the city to compete directly with routes owned by the IRT and BMT companies. The #7 crosstown IRT line terminates at Times Square; it is said that the bumper blocks of the #7 are directly against or very close to the eastern wall of the lower level of the 42nd St. IND station. The construction of the lower level therefore blocked any potential extension of the #7 line to the west side of Manhattan. If this is true, it would have been done only in the spirit of crushing the competition, for the IND had no plans to construct a competing crosstown line. In 1998 and 1999 all but one remaining entrance to the lower level was sealed (the remaining one is under a lift-up trap door at the south end of the southbound platform). A report in the September, 1999 Bulletin of the New York Division ERA reports that the lower level track D-3 from north of 42nd St. all the way to 34th St. is now permanently out of service. Occasionally the existence of the lower level is mentioned as an excuse for why the IRT #7 cannot be extended westward; this new development now renders the lower level useless and it should not pose a problem to run the #7 extension directly through the lower level. 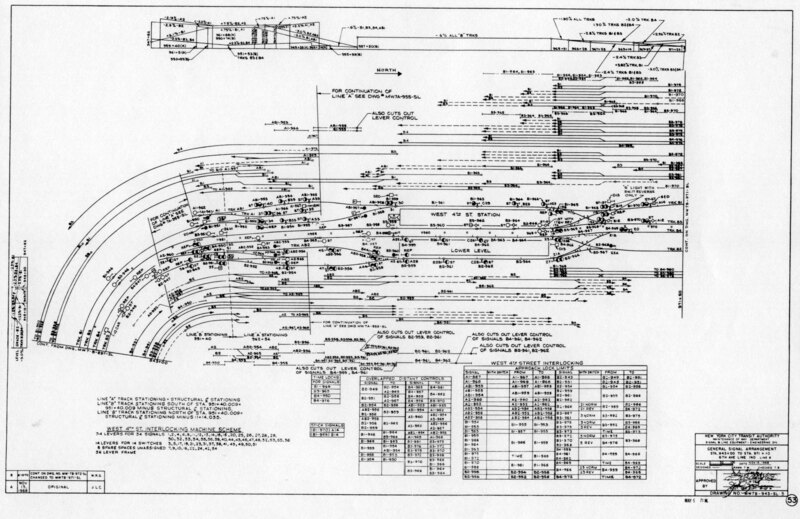 Detailed track map of this area, which shows the lower level trackand switches described above. Four tracks, two side and one island platforms. The two side platforms are used by the local trains and the center island by the express trains. This arrangement was planned to discourage transfer between local and express due to anticipated high volume. At present the tile band and name tablets are maroon with no border. I-beams are dark green. The station has 3 booths on each local platform plus booths on the lower mezzanine. The station also has part time booths in Penn Station itself near the LIRR level for a total of 9 booths! This station is being renovated so the description is subject to frequent changes. This station is the 5th busiest in the system. Two side platforms, four tracks. There are exits at 25th St. (5 steps up), 24th St., and 23rd St. (platform level). A crossunder is at the 23rd St. end and a closed crossunder at 25th St. Tile and name tablets are gold. Four tracks, two island platforms. Tile and name tablets are gold. This station has a full mezzanine, with new tile adding a brown border to the top of the gold stripe. The vastness of this mezzanine is also home various NYCT training schools. There is a closed passageway to the Seventh Ave. IRT behind a grille, which is now used as an emergency exit. A transfer to the BMT Canarsie Line is at the south end. This station is being renovated at this time. The 14th St. station is approximately 20 feet below street level. Two track levels, four tracks and two island platforms on each level, with a full-length mezzanine between the two levels (not above). 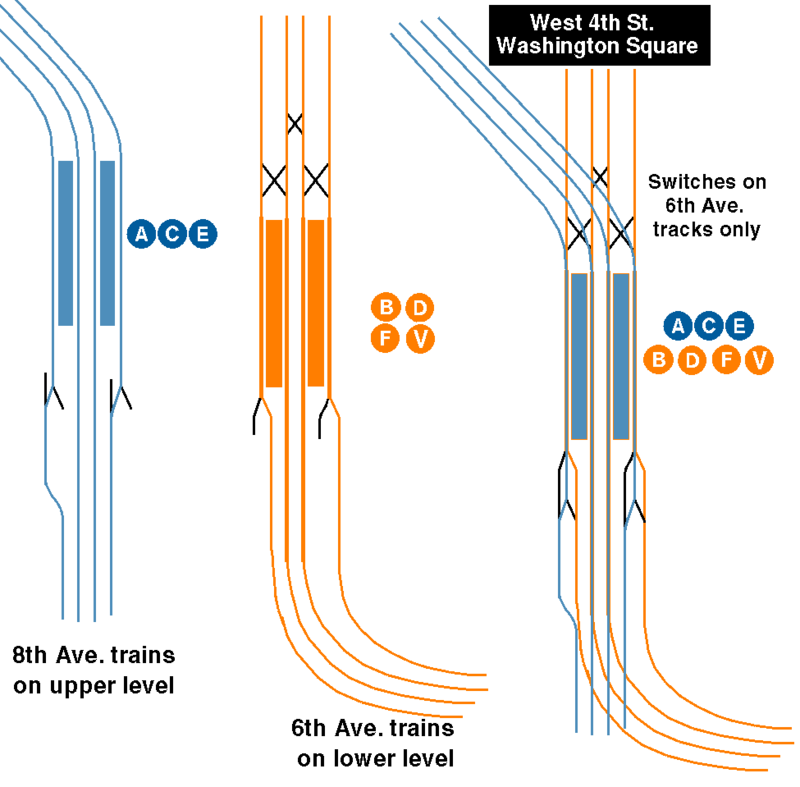 The upper level services trains from the IND 8th Avenue subway, and the lower level services those from the IND 6th Avenue/Houston Street subway. The upper level began service first, beginning in September, 1932. The first service on the lower level was a shuttle along Houston Street to 2nd Avenue, starting January, 1936, with through service along the 6th Avenue local tracks starting December 1940. The 6th Avenue express tracks were built later, and didn't begin service until July 1, 1968, so between 1936 and 1968, the express tracks here at West 4th Street (and also at 34th Street/6th Avenue) were used as terminal tracks only. The station, which doesn't actually have an exit to 4th St., is probably so-called to differentiate it from the planned IND second system South 4th St. station/line in Brooklyn. There are two fare control areas; one reached via ramps at the south end of the two upper level platforms, in a small "mezzanine"; and one at the south end of each of the upper level platforms. Since the fare control areas all lead directly to the upper level (8th Avenue) platforms, passengers for 6th Avenue trains walk a short distance along the upper platforms to the stairs down to the mezzanine, and thence to the lower level platforms. Crossover and transfer is provided via the mezzanine. Elevators were recently added connecting the two platforms and the mezzanine. The mezzanine now houses a large NYCT office complex at the north end; closed stairways from the lower level platforms reveal the "shortened" mezzanine above. Rumor has it that there used to be direct exits to the street from this middle level mezzanine. For a station this large it actually has relatively few and small exits to the street; this station was meant as a mass transfer point between the two trunk lines. The tile adornment is standard IND; both track levels have dark green tile stripes with an even darker green border. There are no other artworks or mosaics along the platforms or trackside walls. The streets around this station bear scars of the IND construction. Sixth Avenue started at 3rd Street; there was no street continuing south at that point. A new street was sliced through the Village to accommodate the new subway. Bits and bites of the adjoining blocks were cut off by the new street. There are numerous buildings with sides ripped out and bare; many have been cosmetically redone over the ages. This slicing through of the IND subway (and of the IRT West Side line as well) helped contribute to the triangular blocks so famous to the Village. This new southern extension of Sixth Avenue is extra wide to fit the cunning interchange between the 6th and 8th Avenue lines. South of the station there are three levels of track. The 8th Avenue express is the upper level. The local tracks of both lines are in the middle with their flying junction. The 6th Avenue express is the lowest level. Two side platforms, four tracks. Tile is dark blue with a darker blue border, with name tablet colors reversed. A mosaic "Spring Street" name tablet is also present. A crossunder is at the south end. Southbound has a center high exit. Fare control is at platform level. Four tracks, two island platforms. This is the last Manhattan express station. Tile color is the same as Spring Street, and there is a "Canal Street" mosaic. The platforms are offset due to switches between local and express at both ends. A crossover between directions is at the southernmost stairs only. The full size mezzanine has been reduced by a police precinct and fare control is now in the center. The station is being renovated, but the floor tiles are already cracking and are marked for replacement. South of the station the tracks split into two levels. These partly allow the future junction of the IND Second System Worth Street line, which has a turnoff provision in the tunnel wall, and to align the track to enter the peculiar Chambers Street station. From this station clear to the World Trade Center the street is widened for the IND subway. The west side of Church Street was sliced back some 20m to acquire a corridor for the full four tracks of the line. The buildings on this side were either demolished, revealing bare faces on ther newly exposed neighbors, or they were truncated with new enclosures on the cut faces. Church Street was originally a seamless extension of Trinity Place and was wide enough for only a two-track line. Between Canal St. and Chambers St. the tracks split and cross at a grade separation, with the express tracks to Brooklyn via Chambers Street station on the west side and the local tracks to the stub-end World Trade Center center on the east side. An interesting remnant of planning for the IND Second System is visible from the front of a southbound local train: a bellmouth in the tunnel heading to the left (east), presumably to follow Worth Street to South 4th St., Brooklyn. Chambers Street/World Trade Center is a large station complex; it is really two stations in one connected by an upper mezzanine. For purposes of this article, the express tracks which continue to Brooklyn will be said to stop at "Chambers Street," while the local tracks which terminate here will be said to stop at "World Trade Center" station. The Chambers Street Station is to the northwest and has two tracks with a single island platform. The tile band is dark purple with black borders and no name tablet. At the south end the tracks begin to descend and they will actually pass under the World Trade Center terminal station. A mezzanine above provides access to the World Trade Center portion of the station as well as to the Brooklyn-bound IRT. The World Trade Center terminal station has the same tile color scheme as the Chambers St. station. New wall tile has been put up here, forever covering over the old tile which indicated a secondary name of "H and M", for the Hudson & Manhattan Railroad (now PATH). One of the photos below shows a part of the unrenovated tile showing the "H and M" name. This station has two tracks with bumper blocks at the south end, and one island platform. An old side platform on the western side has been fenced off to be outside the fare control and provides access from the World Trade Center to the mezzanine above the Chambers Street portion of the station. The exit at the south end of this platform is at platform level and leads directly into the World Trade Center via a short ramp. A north exit is one flight up to a mezzanine, then another flight to the street. Due to the convoluted shape of the mezzanine's fare control area, the transfer from the World Trade Center station to the IRT at Park Place requires going up to the mezzanine, down to the Chambers Street station platform, up to the mezzanine again, and then down to the Park Place station. This is apparently not a very frequent transfer and access to the IRT is also available at the next station, Broadway/Nassau-Fulton Street. Two tracks, one island platform. This deep station has a similar round tube design as at Broadway/Nassau; it even has the same lilac purple and deep violet tile band. The closely-spaced captions read simply "High" and do not mention the Brooklyn Bridge. The station features a narrow, full-length mezzanine with escalators to fare controls at both ends. While there is no name tablet, mosaics indicating "To All Trains", "To Fulton Street", and "To Adams Street" are present in the mezzanine and are set in bright purple tile. A painted sign points the way to the nearby St. George Hotel and another indicates the presence of the nearby Red Cross Building. The station exits are on either side of Cadman Plaza - one on Adams Street almost directly at the foot of the Brooklyn Bridge, and the other on Fulton Street, opposite Cranberry Street. High Street itself (which runs for exactly one city block) is not really at the station proper, but the subway tracks do lead underneath it before turning south onto Jay Street, so the station's name is somewhat of a misnomer. New escalators are being installed at both ends. The Adams Street mezzanine is being reduced in size. There is a long passageway leading from the Adams Street exit to the stairs leading to the street above. Express station with two island platforms and four tracks. 8th Avenue/Fulton service is on the "express" track and 6th Avenue service (from/to the York Street station and Rutgers St. tunnel) is on the "local" track. Tile band is blue and there is no name tablet. I-beams are tiled southbound and painted blue northbound. A closed tower is on the south end of the southbound platform, and an active tower is at the north end of the northbound platform. The mezzanine, which was once open along the entire length and width of the station, is now very fragmented. From the mezzanine there is a closed passageway under Myrtle Avenue which was used for the old Myrtle Avenue Elevated transfer. There is a direct entrance to the NYCT administration building which is "guarded" by a Transit Bureau police station. In December, 2010, a transfer corridor opened connecting Jay Street-Borough Hall with the Lawrence Street-Metrotech Station of the BMT. The project began in 2007 and included full rehabilitation of the Jay Street Station, and installation of full ADA accessibility to both the Jay Street Station and Lawrence Street Station platforms. The new transfer connector runs from the east side of the Jay Street Station mezzanine to the (railroad) north end of the Lawrence Street station, a total distance of about a half-block along Willoughby Street. The Jay Street-Borough Hall Station was fitted with a loading dock to collect cash from the transit authority's revenue train. Drop-offs for the IND division were made at a roll-up steel door on the side wall of the Brooklyn-bound F track by a consist of R-21 ex-passenger cars outfitted for revenue collection purposes. The TA no longer uses revenue collection trains. The MetroCard program has reduced the use of cash to pay fares, and today, the TA relies solely on armored trucks to transport revenue cash.